Milan is special to me. In Northern Italy, the likes of Lake Como, Venice and Genoa receive attention for their outdoor beauty. The romantic kind; mountains and cliffs backdrop colourful terraces which hunch over the lake and coastline. Gondolas slip away into Venetian side streets. Milan is different and the first of Northern Italy I visited for a long weekend. It boasts modern sophistication and city heritage, leaving the ancient cultural melting pot to other hubs. Whilst the city is comparatively expensive, it carries great confidence with a lead in global fashion, Italian industry and financial services. So where did I visit? You would struggle to miss the Duomo even if you tried. This cathedral, the largest in Italy was constructed from the 13th century in the style of Gothic architecture and took 6 centuries to complete. Considered the greatest tourist attraction in Milan, I would recommend buying tickets online or getting there early in the morning to queue. Inside, I admired the religious artwork, biblical sculptures and ornate stained glass windows. I went upstairs to the roof of the cathedral. There are a number of steps and the footpath around roof arches is narrow but it is worth slowing down to navigate; the spires have a unique design and it's a chance to get closer to the detail. I find this just as beautiful as the view from the front. The main section of the roof is an open space, with white marbled spires lined in symmetry. Don't forget to peer through gaps in the walls for a view of the city's square! The Galleria is grand in appearance but dainty in design. The glass vaulted arcade was built to connect the Duomo and Scala theatre as part of the plan to modernise Milan after Italy's unification. What now houses designer shops, cafes and restaurants used to be a place for the Milanese elite to shop and gather. Unsurprisingly, the shops are now relatively quiet, with most tourists admiring the arcade's interior, as opposed to shopping. Back outside, the arcade's mosaic floor presents imagery of Rome, Turin, Milan and Florence. Despite some of its offerings, the Galleria is still a place for everyone to spectate and even when I hadn't intended to visit, its connectivity meant i'd pass to reach other places in the city, such as the Brera district (15 minutes from the square). Is a trip to Milan complete without getting a taste for its fashion? Although exported worldwide and high-fashion exhibitions can be found elsewhere (in London I went to the Louis Vuitton exhibitions), attending one in its home city is a treasured experience. The Armani museum is a multi-story gallery showcasing the designer's key pieces of work. It was interesting to see how his view of women's role in industry (one of participation and equality) was woven into his designs. The exhibition explained this as inspiring female garments designed with sharp and broadened shoulders which were sometimes matched with trousers. Minimalism is another key component of his designs. Bosco Verticale (meaning 'Vertical Forest') is what I imagine more apartments may seek to provide in the future: sustainable housing. The two 'eco-towers' house more trees, plants and shrubbery than people, and provide nourishment for animals. With a similar project underway in London, this wasn't entirely new to me, but it was interesting to see one of this scale already completed. Having lived in apartments for years, the infusion of more greenery has some appeal...but at the same time, how much is too much? Brera: The Brera district, within walking distance from Galleria (15 minutes), can be enjoyed during an afternoon visit for art lovers or as a relaxing stroll in the evening. You will pass various shops, many of which are around art, fashion and design (the Academy of Fine Arts and Brera Gallery can be found here), as well as a number of bars and restaurants. Brera is said to have a bohemian feel within Milan and bears some semblance to traditional Italian architecture. Arco Della Pace: I passed Arco Della Pace, a triumph arch which was built to celebrate Napoleon's victories, on the way back to my accommodation near the Duomo. It's situated at a roundabout surrounded by lively restaurants with outdoor seating. Shortly after going to the arc, I headed to the opposite buffet where I was seated with a lawyer who had just arrived on secondment. This made for a warming and interesting conversation given my own background. Galleria Cafes and Restaurants: there are a few choices around here such as Salvini, Biffi, serving traditional Italian cuisine. I went to 'Galleria Restaurant' for coffee and tiramisu. The restaurants and cafes here are slightly more expensive due to location, and admittedly, you are likely to find excellent food elsewhere for a lower price once you move away from Galleria and The Scala Theatre. Sadly, the Gucci cafe is closed, in case you are wondering, like I did before I went! Cereisio 7 Bar and Restaurant: Cereisio 7 is a luscious restaurant and bar designed by DSquared (Italian mid-end luxury brand). The rooftop gradient pool is its striking feature, surrounded with compartmentalised seating for privacy. No swimming is allowed, however. I was here during the day for tea. By night, the city view from here I hear is stunning, and the rooftop atmosphere livens. 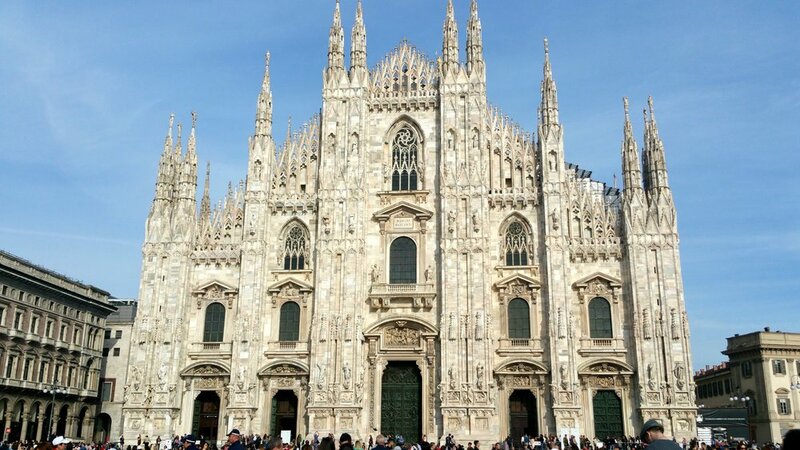 Ever been to Milan, or want to Visit? Please share your thoughts below!